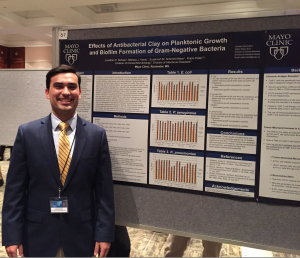 Recent grad Jonathan Nicklas (Biology and Philosophy, 2018) is now a Fellow at the National Institute of Health (NIH) National Institute of Allergy and Infectious Disease. Highlights from his responses to our questions are below. What do you miss about Scranton and/or the U? J.N. – Although I only graduated a couple months ago, I am certain that I will miss the Special Jesuit Liberal Arts Honors Program. Aside from my science courses, I greatly appreciated the collection of thinkers and their ideas we discussed in the philosophy courses throughout my four years. I also am grateful for the teachers who made this unique program possible. If you could give one piece of advice to current students, what would it be? J.N. – I would suggest that she or he relinquish the concept that college, or life for that matter, has a set formula with rules that must be followed. There is no rule that states which major a student must graduate with… There is no rule that you, as a student, must do what all your peers are doing… choose a major that they are passionate about, explore what they can do in that field, speak with and get in contact with as many people as they can, and most importantly strive to do their best in whatever they choose. There are many avenues to succeed so long as a student has the drive to take them. What [Biology] class was most helpful to your current path, and how? J.N. – Microbiology Lab was the most helpful class for my current path for three reasons. First, this class introduced me to the microscopic world of bacteria. Second, this class helped me realize that I enjoyed regularly working in a lab setting. Finally, this lab taught me fundamental lab skills that I still use frequently in my current position. J.N. – I learned that failing makes you a better researcher. For example, I am certain I incorrectly calibrated the instrument I was using to do readings for my project. Therefore, about one month’s worth of data I collected was erroneous and I had to redo it. Instead of quitting, I spoke with Dr. Smith and became more cognizant of the calibration protocol. I then collected adequate data I could use. This experience taught me that failing is a part of working in a lab. However, this lesson also taught me that being a truly great researcher means coping with your mistakes and transforming them into successes. J.N. – In the future, I hope to have a career in medicine. I am specifically interested in working with clinical trials someday as it will allow me to have an open dialogue with patients and fellow physicians in the clinic along with researchers in the lab. This entry was posted in Alumni Spotlight. Bookmark the permalink.